"Galaxias maculatus (inanga): Commonest and most prized of the five species, this whitebait makes up nearly all of the catch in the many rivers and is a market favourite because of its transparency. The inanga ('inaka' to the South Island Maori) grows to about 15cm, a slender fish with silver belly and greenish coloured back. Like its cousins, it is scaleless. Common in estuaries, swamps and rivers near the sea. Galaxias brevipinnis (koaro): Probably the second most common whitebait, it is found in snow-fed rivers offering access to its adult habitat-- swift-flowing, rocky streams in forest areas. As a juvenile it is recognised by its milky appearance. It grows to about 20cm, a sleek fish coloured olive-green to brown with greenish-gold blotches on its sides. Galaxias fasciatus (banded kokopu): About as common as the koaro, it arrives in the river with a pale amber tinge through its body which gives rise to the name 'golden bait'. Deep olive to brown as an adult, with distinguishing pale vertical bands across its sides and back, it grows to about 26 cm and is found in bush streams and swamps. An important food to the Maori in early days. Galaxias argenteus (giant kokopu): A rarer species, this kokopu also carries a slight amber colour as a whitebait and is usually seen towards the end of the fishing season. As an adult it is the heavyweight of the Galaxias species, growing to over 50cm.Its adult habitat is commonly small swampy streams, swamps and lakes near the coast. 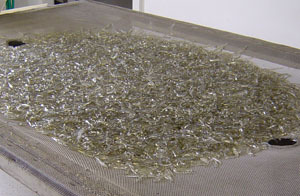 Gold spots, rings and crescents are distinguishing features of a fish which whitebaiters have difficulty accepting as the adult form of whitebait. Galaxias postvectis (short jawed kokopu): Another rare species, this fish is of no great significance in the whitebait catch. It is distinguished from the other kokopu species by a short lower jaw. Its adult colouring is drab- dull green to brown with pale marblings on its sides. Scientists deduce from the few sightings of the species that it inhibits streams and pools in unmodified native forest. It grows to about 25cm." 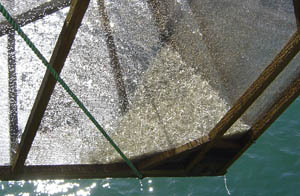 The most common whitebait, the inanga, lays its eggs in tidal estuaries at the time of the March high spring tides. In rushes and grasses usually only covered at high spring tides the female lays thousands of eggs which are fertilised by the male extruding a milt which clouds the shallow water. As the tide falls the eggs are washed to the base of the vegetation and remain there until another spring tide arrives to take them out to sea. Usually this is a fortnight later but can be up to two months and the eggs survive. 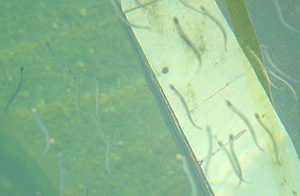 Not a lot is known of life at sea for the juvenile whitebait but it is now accepted they generally return to a similar type of river from whence they hatched after six months at sea. 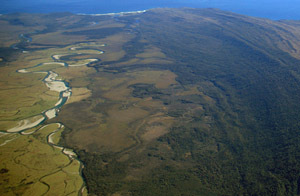 This may be fast snow fed rivers like the Arawata or Waiatoto or the slower swampier rivers like the Cascade. 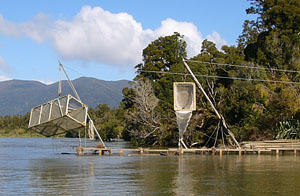 Whitebait are known to travel great distances at sea and to be found in countries other than New Zealand. Once returned to the rivers, whitebait lose their transparency and face the gauntlet of the many predators waiting to eat them. Trout, eels, shags, herons, penguins, and seagulls all line up with man to try the delicacy. From spring to autumn most whitebait live beyond the tidal areas of the rivers but are inexplicably drawn to return to spawn. Scientists believe they are attuned to lunar cycles and can detect an imminent spring tide.